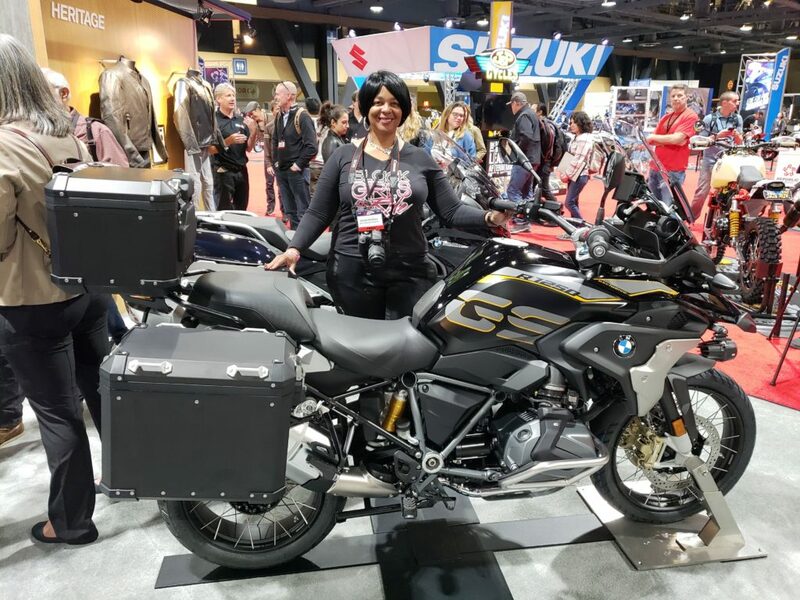 The Progressive International Motorcycle Show (IMS) kicks off in Long Beach, California before traveling across the United States to New York, Dallas, Cleveland, Minneapolis, Washington, D.C and Chicago http://www.motorcycleshows.com/. 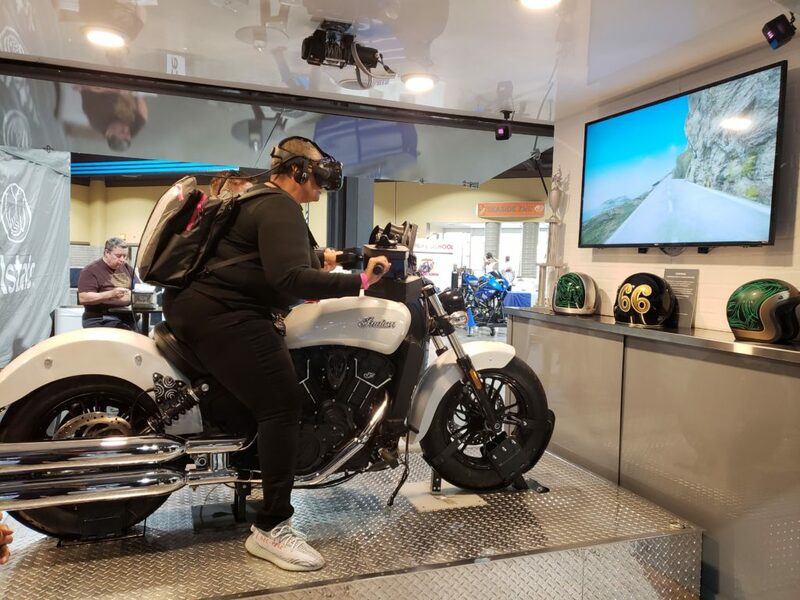 IMS is the perfect place to see, listen, touch and test ride the various motorcycle brands, to purchase products and obtain resourceful information for motorcycle riders, passengers and future motorcycle riders. Electric was the common theme throughout IMS this year. The future of personal mobility is driven by electrification. The industry is introducing newbies to motorcycles with no clutch and no gears. 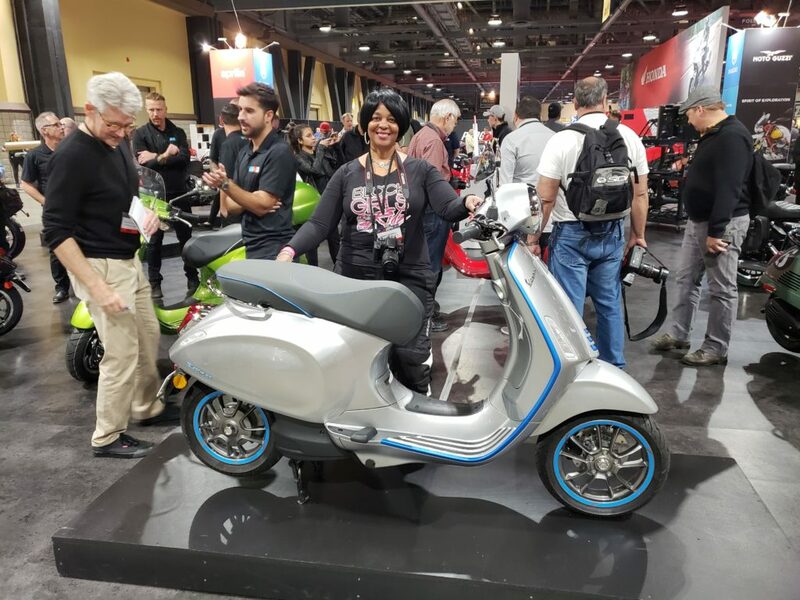 The United States of America will need to get ready to build an infrastructure for electric bicycles and electric motorcycles. 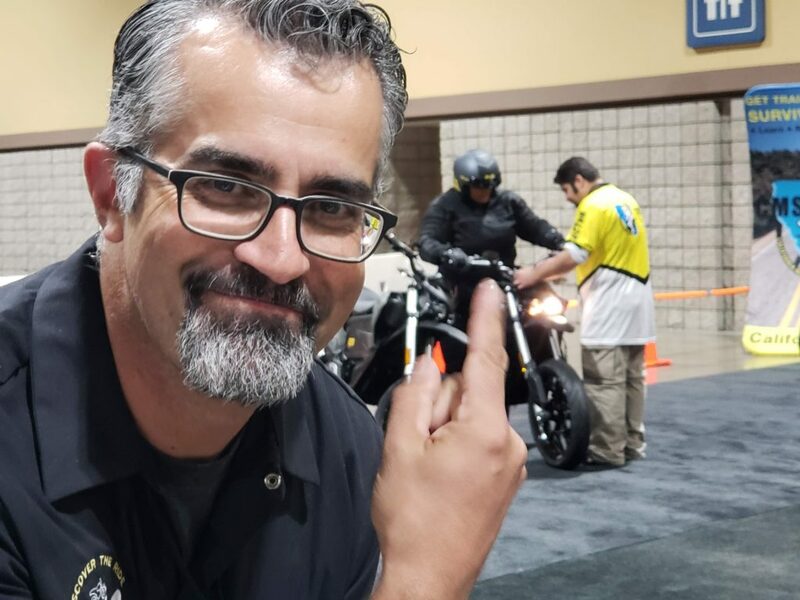 Robert Pandya and his team took the motorcycle industry back to basics by introducing Discover the Ride and New to 2 for children and adults. 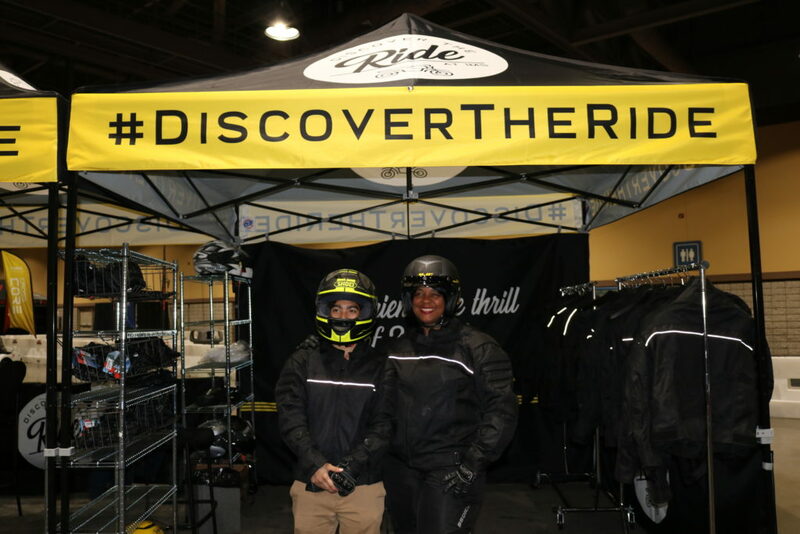 The purpose of Discover the Ride is to put people on motorcycles for the first time at IMS with STACYC, Yamaha Power Assist Bicycles and Zero Motorcycles. 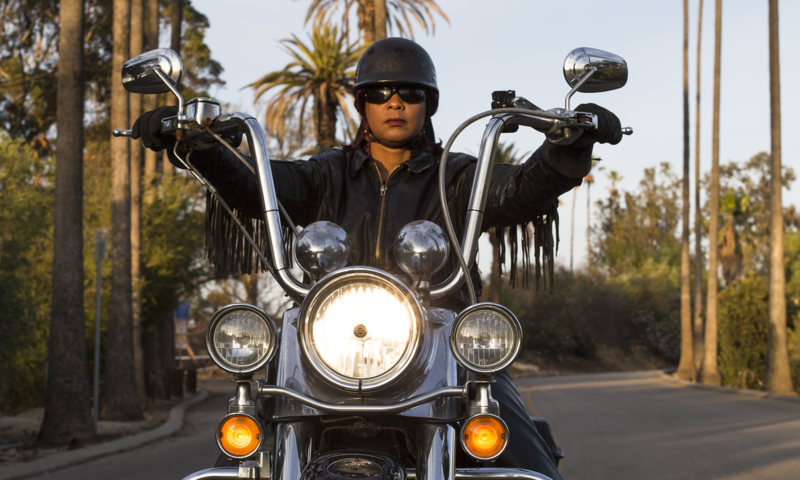 The goal is to widen the funnel and encourage people of all ages to become motorcycle riders. STACYC is the first powered balance bike to inspire children who has been walking for a short time. STACYC offers different models for ages 3-7 years of age. The goal is to engage young children with using a throttle and fall in love with motorcycle riding before the age of seven (7). 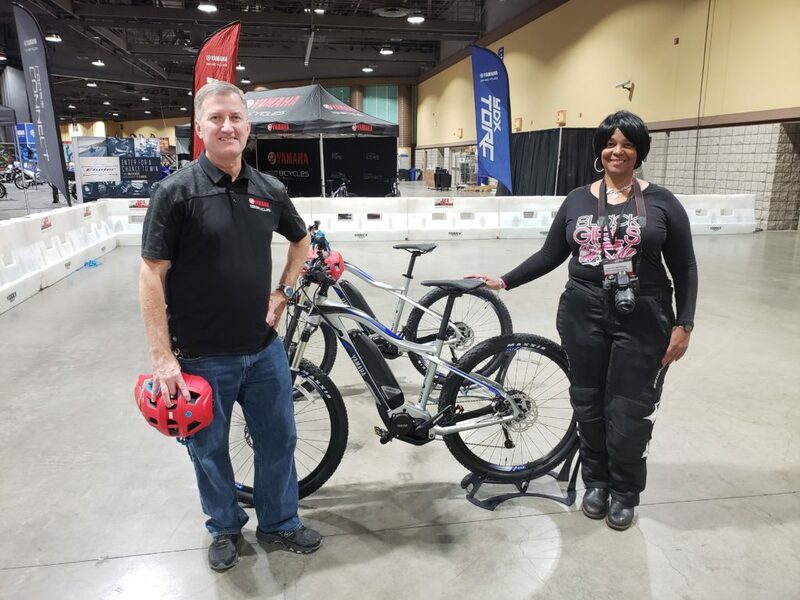 Individuals with no motorcycle riding experience were required to ride a Yamaha Power Assist Electric Bicycle to demonstrate their ability to balance before test riding a Zero Motorcycle. 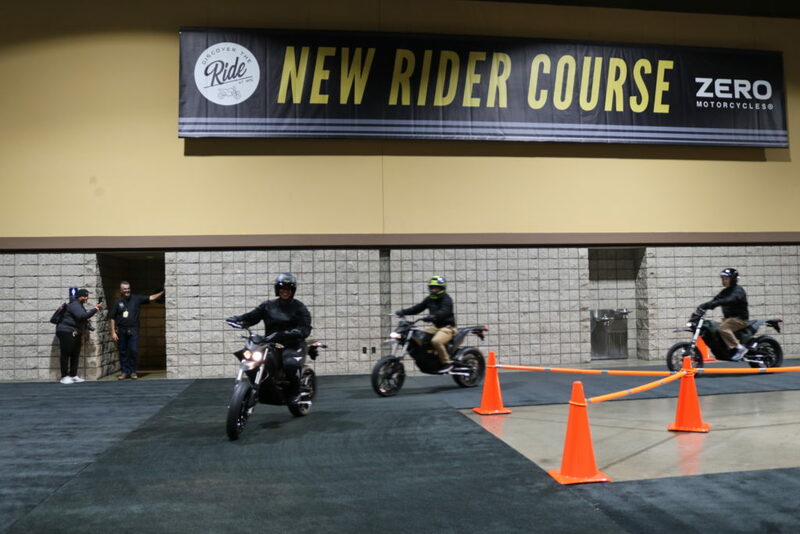 Total Control Training partnered with Robert’s team to provide safety instructors to shepherd new riders at IMS. I had the pleasure of witnessing Discover the Ride at IMS with a first time motorcycle rider and it works! Zero Motorcycles provides a sense of effortlessness just by a simple twist of the throttle without a clutch, gears and low maintenance. 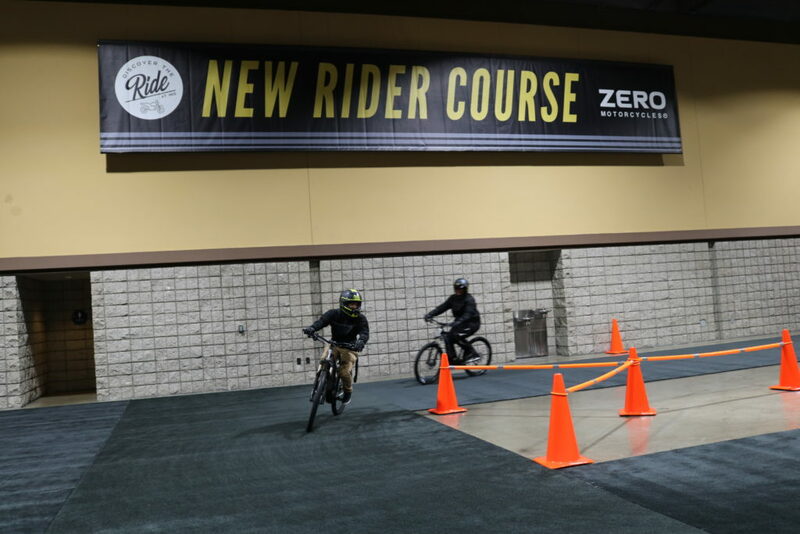 The zero motorcycle is speed limited for test riding to about 12 mph for safety reasons and to allow instructors to have a conversation with riders during the test ride on a test track inside the building at IMS. New to 2 is a video and stage series designed to answer questions for new riders from visiting a local dealer to making a choice of the type of motorcycle to purchase. Yamaha has been making electric bicycles in Japan for more than 25 years. Yamaha is the first pedal assist bicycle manufacturer. The electric bicycle is huge in Europe and starting to grow in the United States of America. Yamaha is starting out with four (4) models from mountain bike, drop bar, road bike and fitness commuting bike. The Yamaha Power Assist Electric Bicycle serves as the step in between STACYC and Zero. There is a cross over from the motorcycle culture to power assist electric bicycles and motorcycles. If it wasn’t for the bicycle, there would not be motorcycles! 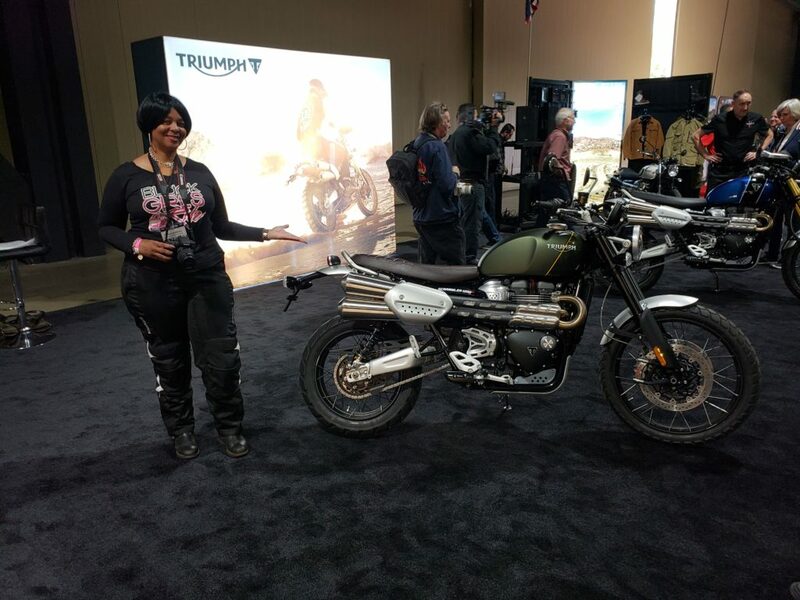 Triumph Motorcycles introduced Scrambler 1200 XE and Scrambler 1200 XC. The Scrambler 1200 XC is good for on and off road riding and the 1200 XE the “E” is for extreme. 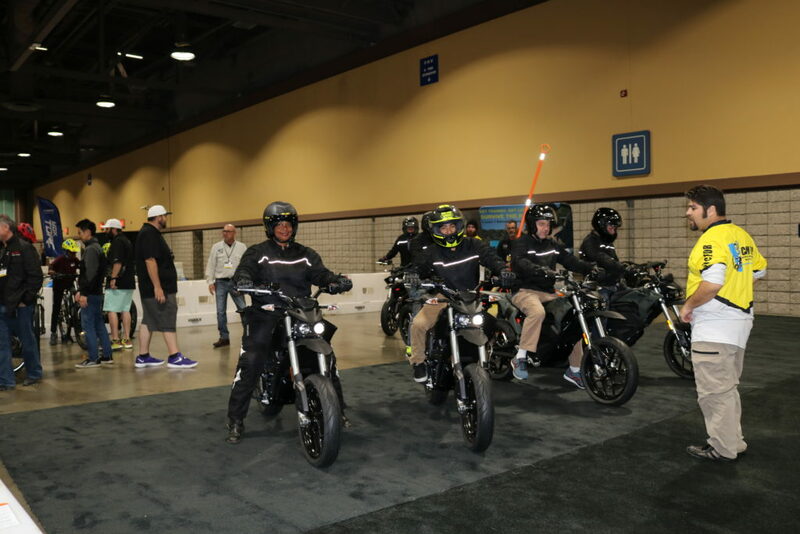 These adventure motorcycles have rider modes rain, road, sport and off road. Cruise control is standard. The 1200 XE is the first Scrambler with a 21 inch front wheel. Bluetooth accessory to communicate directly with GoPro camera to take picture and video and collaboration with Google to allow turn by turn navigation on display. The price of the Scrambler 1200 will be introduced to the United States in December 2018. 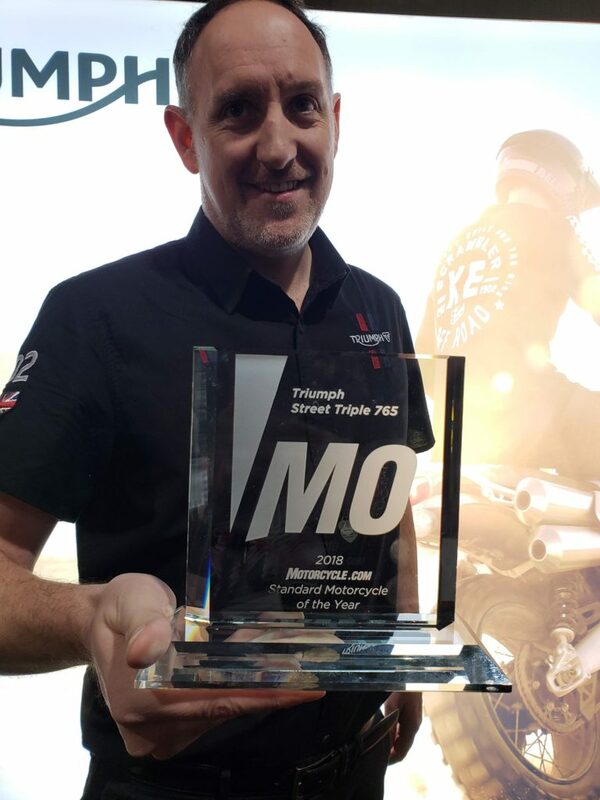 Triumph Motorcycles received the 2018 Motorcycle.com Standard Motorcycle of the Year for the Triumph Street Triple 765. Harley Davidson announced they are celebrating 115 years of motorcycling and the celebration of 28 new dealerships across the globe in 2018. 4.9% growth in Europe and unprecedented growth in Thailand, China and Asia. Harley-Davidson is focusing on growing the number of riders in the United States to 2 million riders by 2027. 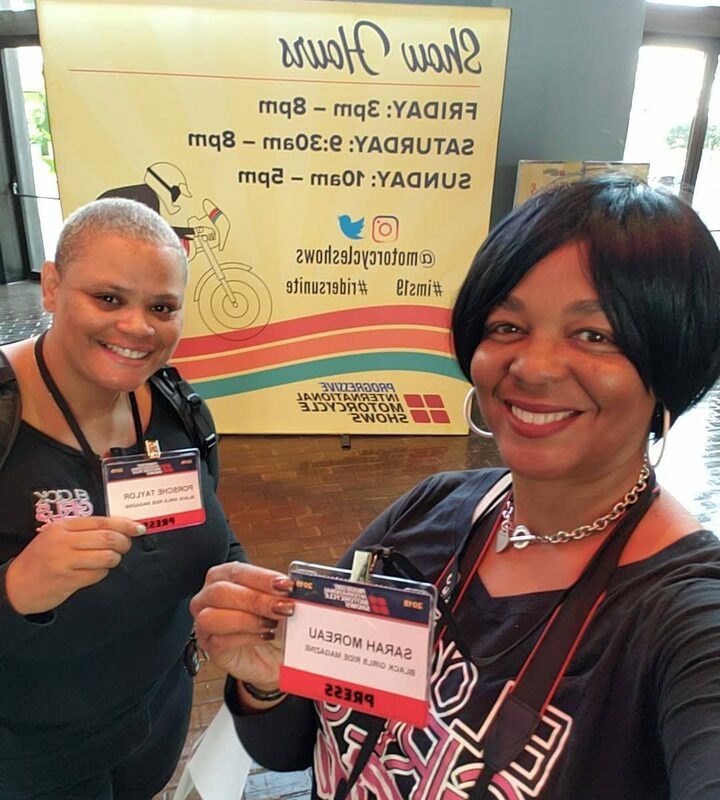 On July 30, 2018, more roads to Harley Davidson was established more roads to access of the information to the media about the bikes about to be sold. Harley Davidson is investing $800 million into the strategy to help the United States grow 2 million riders in nine (9) more years. 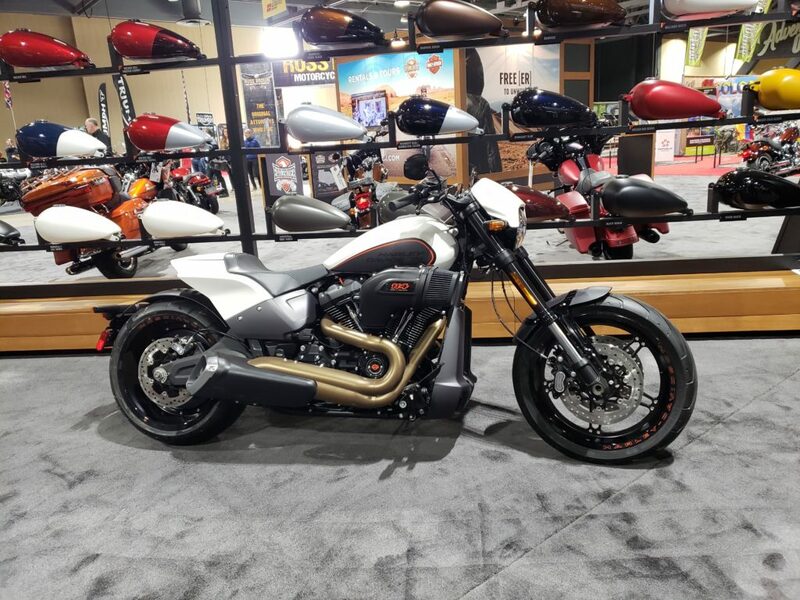 Harley Davidson is starting an electric vehicle portfolio and continue to innovate their touring and soft-tail motorcycles. They will add a low cc motorcycle segment. They will expand their visibility and marketing to capture new riders. They will work with their dealerships across the globe to ensure their dealerships are an inviting place to capture new and current riders. The Milwaukee-Eight 117 engine will be included on touring CVO Street Glide, Road Glide and Limited. These will always get the biggest engine instead of the Milwaukee-Eight 114 engine. Harley Davidson also upgraded their infotainment system on the touring models. The new version is called the Boom! Box GTS Infotainment system include a touch screen with faster download and processing time and it has Apple Car Play compatible for iPhone users, but does not include Android Auto. On display for presentation on the Softail side was the Harley Davidson FXDR 114. This is the 10th Softail motorcycle in just 15 months with the focus on weight reduction starting with cast aluminum swing arm, which provides a 43% reduction in weight. The first Harley Davidson electric motorcycle the LiveWire was not on display. 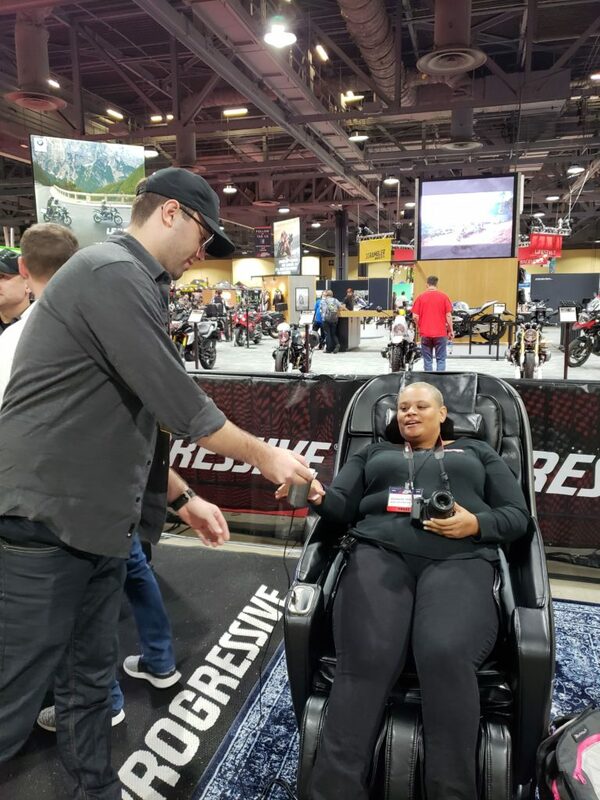 LiveWire specifications will be available in January 2019 and on sale in August 2019. Ural Motorcycles is now in the 20th century with modernized power plant, redesigned thermal group from cylinders and pistons to combat the air cooled function of the motor, increased fin size fins were added and increased the fins size, new oil pick up design to give another ½ liter of oil due to deeper oil pan, fuel injection system, the spare hub and wheels all match with larger spokes, on the motorcycle for simple plug and ride. Ural has been working very hard to keep the look and the opportunity for big kids to feel like little kids. Ural also has its first electric motorcycle concept not, yet a production prototype established in Moscow in 2016. The goal is to collect feedback, to understand what the market wants and how the market reacts to it and if Ural should continue to move forward with the project. Zero Motorcycles is providing engineering support to Ural. 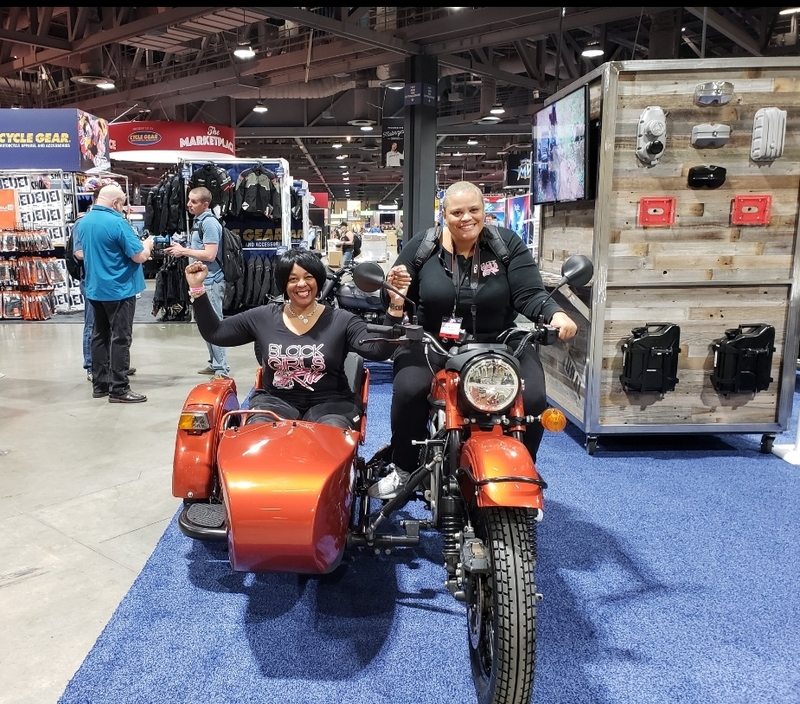 The battery is inside the seat in the sidecar, which feels like there is always a rider in the sidecar for balance, comfort, safety and confidence. There are two batteries one located on the bike and one on the sidecar. The motorcycle will not operate if the sidecar is removed due to the battery under the seat. The production date is not available. BMW is on tract for another year of record growth, which is driven by a lot of the new products such as the G 310 R and G 310 GS. 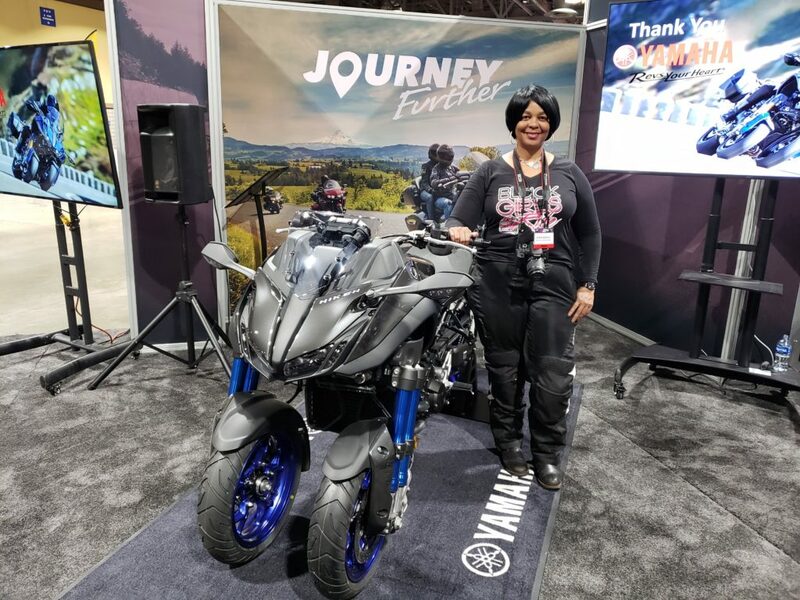 The focus overtime in making sure they bring on products for the market and customers and focus on adding more standard equipment and improving the packages to their motorcycles and features their customers are asking for. The BMW 700 products helped bring a lot of new riders to the sport with 37% of the product sales to women. BMW unveiled the 2019 R 1250 GS with shift cam technology to give more increase power, increase torque and balance delivery for every situation. BMW unveiled the 2019 S 1000 RR. The engine is 9lbs lighter and the overall bike is 25lbs lighter with increased horsepower. The new S 2019 S 1000 R superbike with M package was also unveiled with a weight decrease of 7lbs and motorsports paint. Indian Motorcycle decided to talk about something different than new products after mentioning the FTR 1200 was unveiled in Germany this year. The FTR 1200 won 17 of the 18 American Flat Track races in 2018. Jared Mees captured grand national championships and Indian Motorcycle capturing manufacturers championships in both seasons. Racing has a significance importance to the Indian Motorcycle brand because it started in racing in 1901. 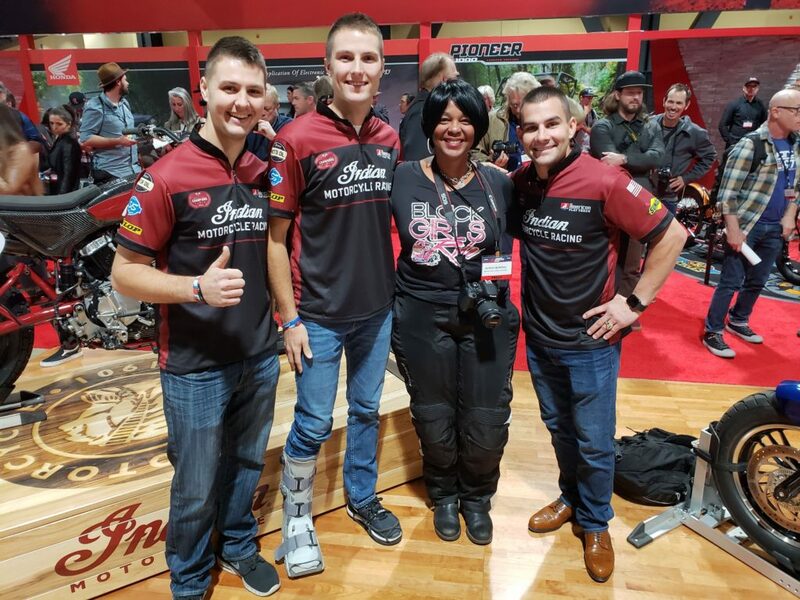 The 2019 Indian Motorcycle Wrecking Crew was introduced Jared Mees and brothers Briar and Bronson Bauman. MV Agusta introduced the 2019 Brutale 1000 and the 2019 Turisom Veloce RC SCS. The Brutale was first introduced to the market in 2002. It is the most powerful superbike. The main principle in Brutale is power. 212 horsepower on a naked bike weighing about 409lbs. All of the body work except for the fuel tank is carbon fiber. The Brutale is an emotional motorcycle with a lot of power and street legal. MV Agusta was one of the first companies to provide unique technology to the motorcycle world. 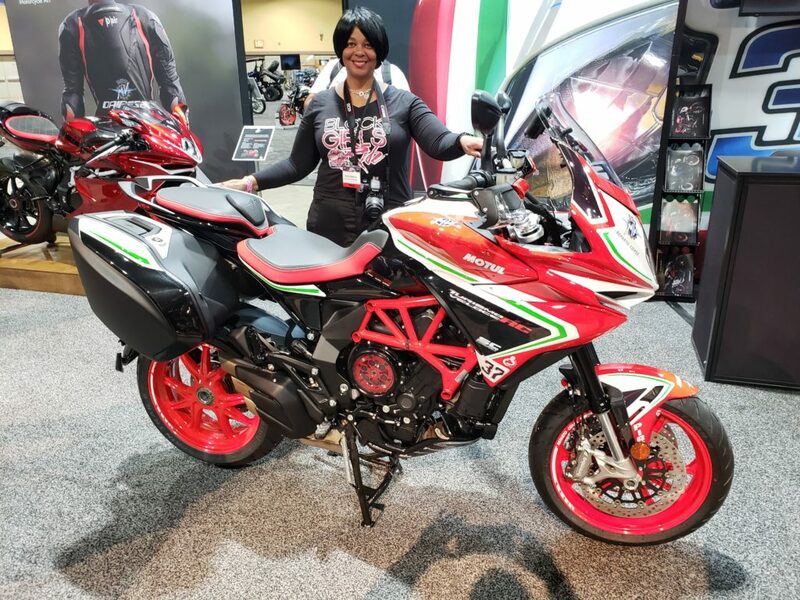 For example, MV Agusta is the first company to put an electronic upshift on a production motorcycle, the first company to put an upshift and downshift on a production motorcycle, the first company to have Full Ride By Wire on a mid-weight super sport motorcycle. They have a new first, the first production motorcycle with a Smart Clutch System (SCS) on the 2019 Turismo Veloce RC SCS to allow riders to use either manual or automatic clutch operation. Riders never have to touch the clutch lever. Riders don’t have to worry up using the clutch lever while moving through traffic. The bike weight is 435lbs with 110 horse power and goes from 0 to 60mph in 3.1 seconds. MV Agusta is about performance not touring. Yamaha introduced nine (9) new models for 2019 in the three (3) main categories of dirt, road and tour. The focus is to continue to offer a wide range of new and exciting motorcycles with the latest in performance and technology for riders of all ages and skill levels. Niken and Niken GT multiple wheel motorcycle handles like a two (2) wheel motorcycle offers motorcycle riders a lot more confidence while cornering to make riding less stressful and fun. Yamaha sold out of Niken motorcycles after opening an online reservation program in September 2018. The Niken GT is open for online reservations with a retail price of $17,2999 for delivery in March 2019. The 2019 Moto Guzzi V85 TT was introduced and it will be available from Italy in the 2nd Quarter of 2019. The world superbike was also on display 2019 Aprilla RSV4 RR Factory 1000. This motorcycle has won multiple world championships and work superbike. Piaggio is the only manufacturer that is up for scooters sales. Kawakaki introduced their super charged hyper sports bike Ninja H2, H2R and H2 Carbon. The new H2R is the most powerful super charged engine Kawasaki has made to date. Also on display was the ZX-10R with new engine design and maximum performance. The Kawasaki Ninja ZX-10 RR is a race ready limited model with only 500 available in the world. 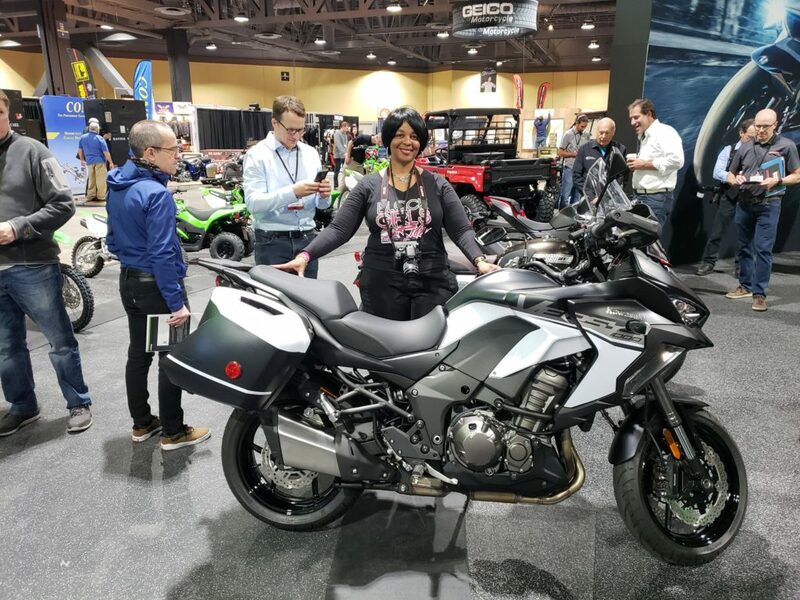 2019 Kawasaki Versys 1000 SE LT Plus was unveiled with cruise control, traction control, intelligent braking system, sport, road, rain and manual modes. There will be a Rideology app available in 2019 to allow riders to make adjustments from the palm of their hands on their Android or iPhones devices to check fuel gage, service intervals and riding module to identify routes taken and for planning. 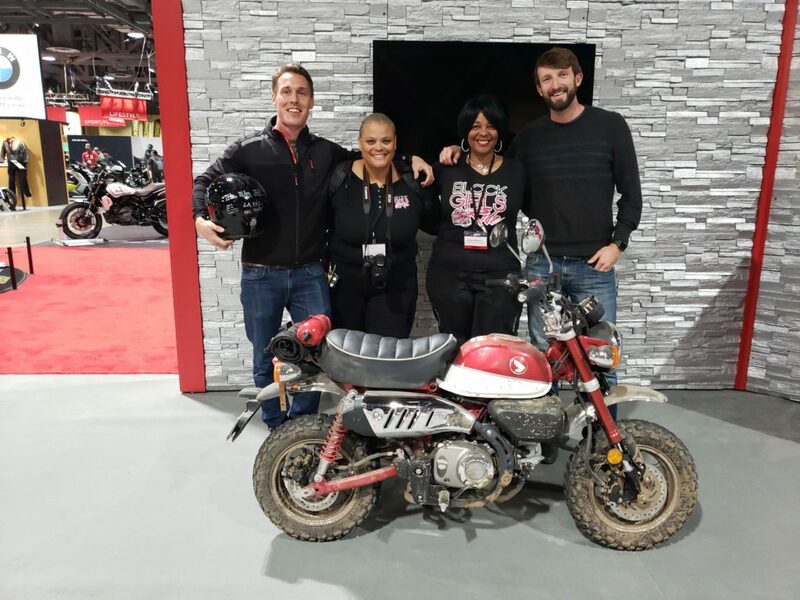 The Honda Monkey is selling out like hotcakes because it’s a fun motorcycle to ride for 1,200 miles on land, through water and mud just ask Ari Herring and Zack Courts. Ari and Zack rode Honda Monkeys from Ensenada to La Paz Mexico to trace some of the Baja 1000 course. 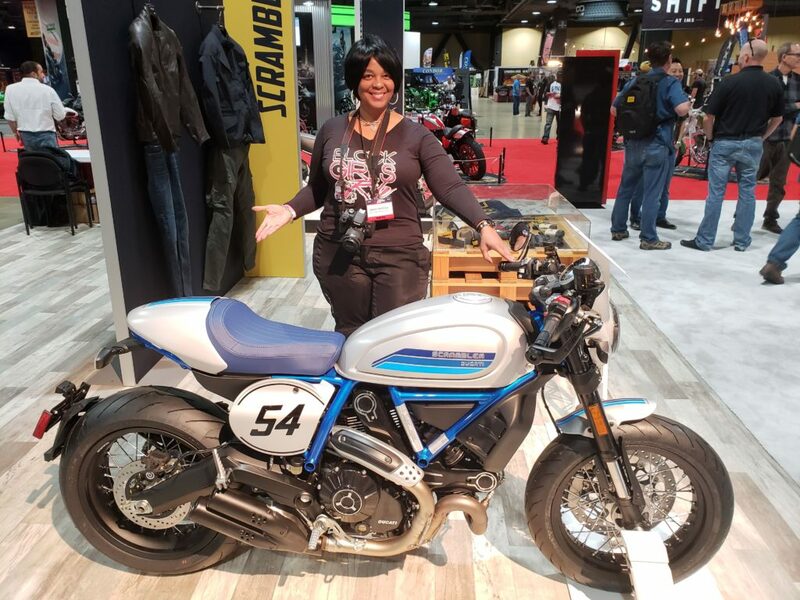 Motorcycle enthusiast can check out their show at Motorcycles on Motor Trend: Throttle Out http://bit.ly/2FmWUEq on November 21, 2018. Progressive is number one in motorcycle insurance due to customer service with policies starting off at just $75.00 per year. 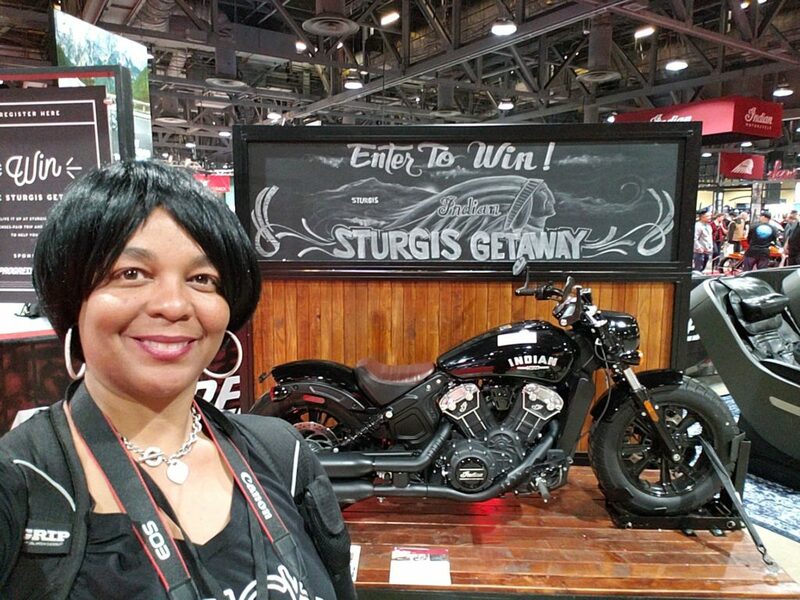 Progressive partnered up with Indian Motorcycle to give away an all expense paid trip to Sturgis with two loaner Indian motorcycles for winners to ride. Flo’s Chop Shop offered relaxation break in massage chairs while listening to an interactive music play list created by guest, beard trims, line ups and hair designs for free. Engergica approach motorcycles in 2009 and decided later to go green. In 2014, Energica created an electric motorcycle as an opportunity to attract the younger generation. Today, the Energica Ego is known to the world for the first street legal electric Italian sport motorcycle. 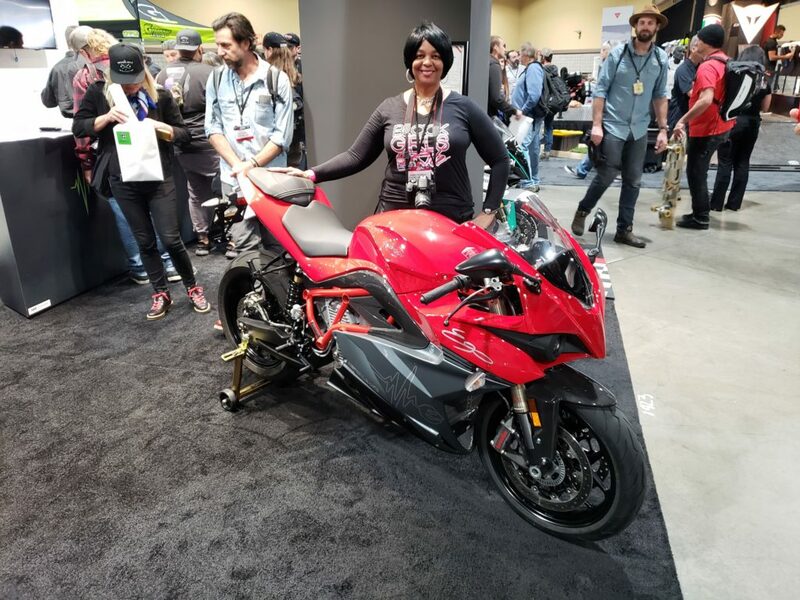 Engergica’s focus is on style performance and quality and they are living up to it with the ability to charge an electric motorcycle within 20-22 minutes! Industry gearhead and living legend Kevin Cameron provided history of Suzuki. Mr. Cameron has decades of experience in the motorcycle industry from racing to technology, product development and product evaluation. Mr. Cameron shared his knowledge and history about Katana motorcycles, 2 stroke engines, 4 stroke engines, horsepower, crankshaft seizure, piston seizure problem in 2 stroke engines, connecting rod, combustion, cylinder plating and oil consumption. Mr. Cameron expressed the greatest problem facing product development is the internal friction of large human groups, engineers wasting times on committees and in meetings. It’s important for the motorcycle industry to allow engineers to devote their time to designs and test prototypes. 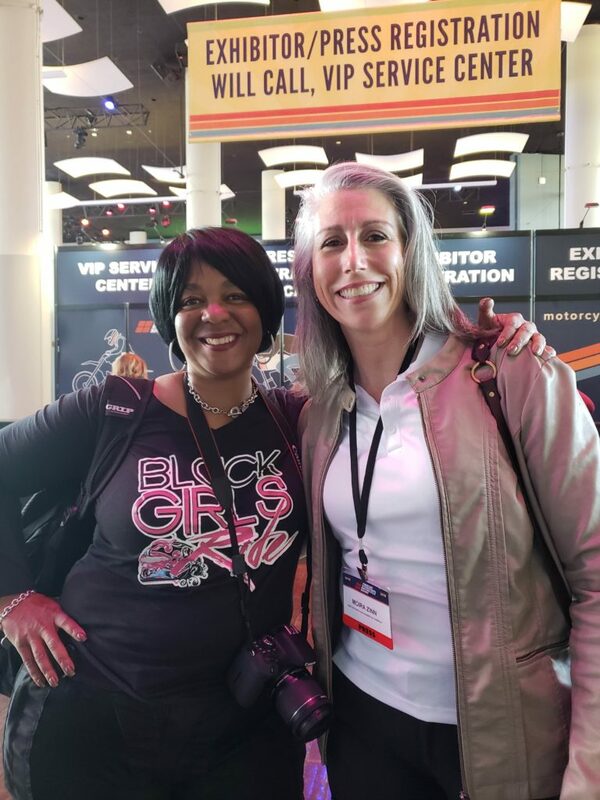 Black Girls Ride Magazine Porsche Taylor, Founder and Editor-In-Chief and Sarah Moreau, Staff Writer enjoyed lunch sponsored by Suzuki with Serena Bleeker, Digital Campaign Manager, Bonner Motorcycle Group and Julian Eger, Communications, http://Motorcycles.org aka Discover Today’s Motorcycling. Ducati delivered the highest level of market share, which demonstrates taking the brand into new worlds with cruiser and off road motorcycles. The Scrambler Café Racer is one of the most popular motorcycles with LED light and fuel gage for first time motorcycle riders at a reasonable Ducati price. 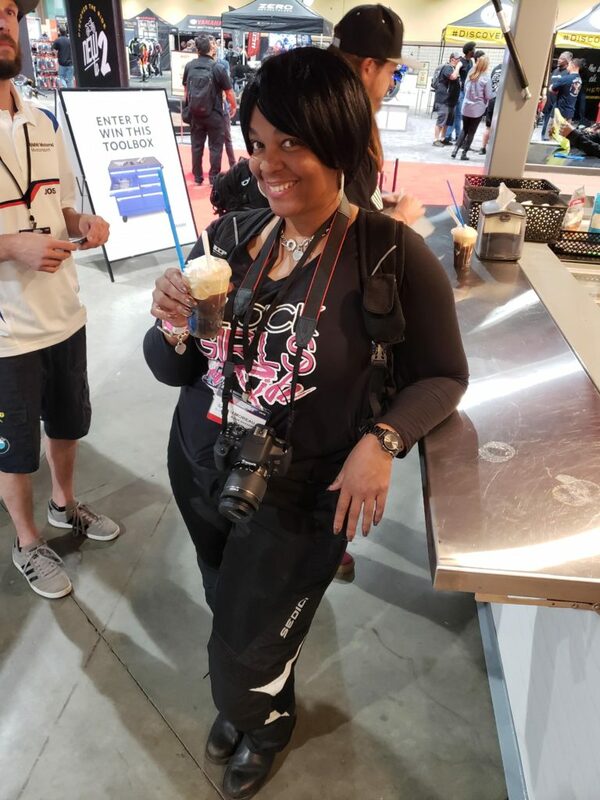 Allstate Insurance offered guest to Float In and Fill Up on a Free Root Beer Float and the opportunity for current, new and future rides to enjoy an interactive virtual reality motorcycle ride on an Indian Scout. IMS is a one stop shop for motorcycle riders and passengers and a great place to network, catch up with old friends and plan a future ride within or outside the country. 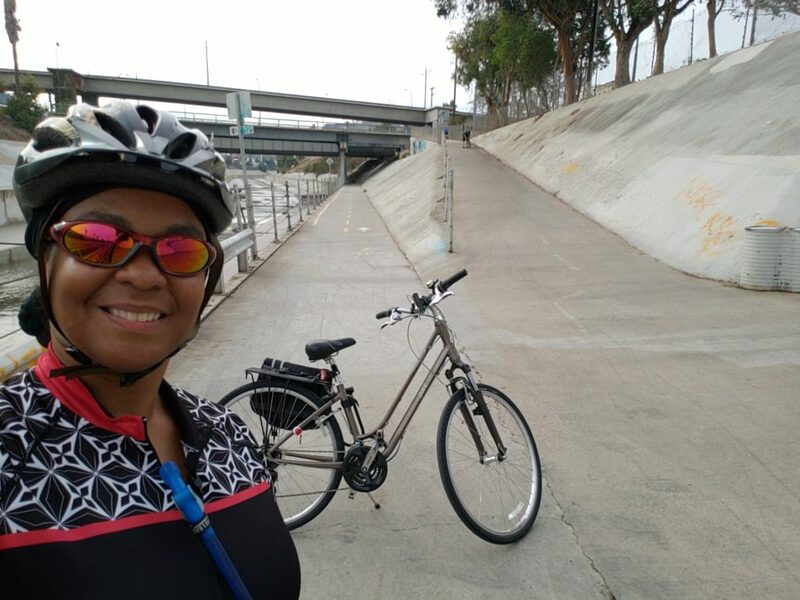 The Ballona Creek Bike Trail is a great place to ride if you are trying to build up your endurance to ride up hills since there are some steep hills and ramps to enter and exit. 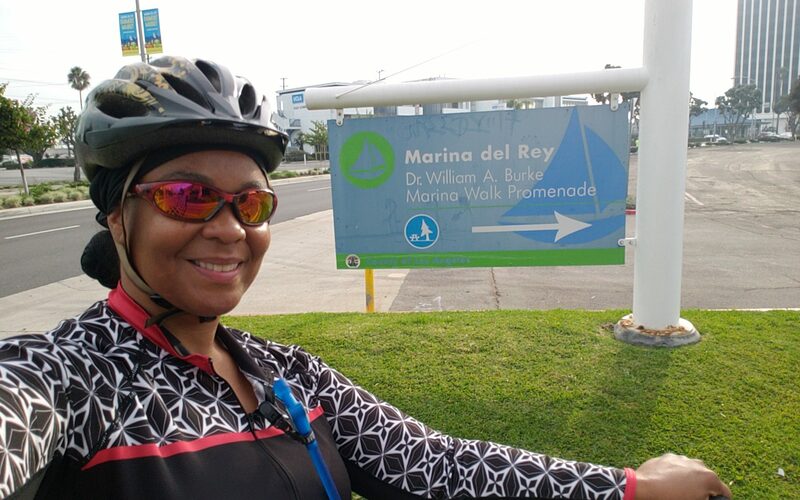 My 17 mile bicycle ride on my Giant Cypress DX started on the Metro train located at the Western/Exposition station to downtown Santa Monica. 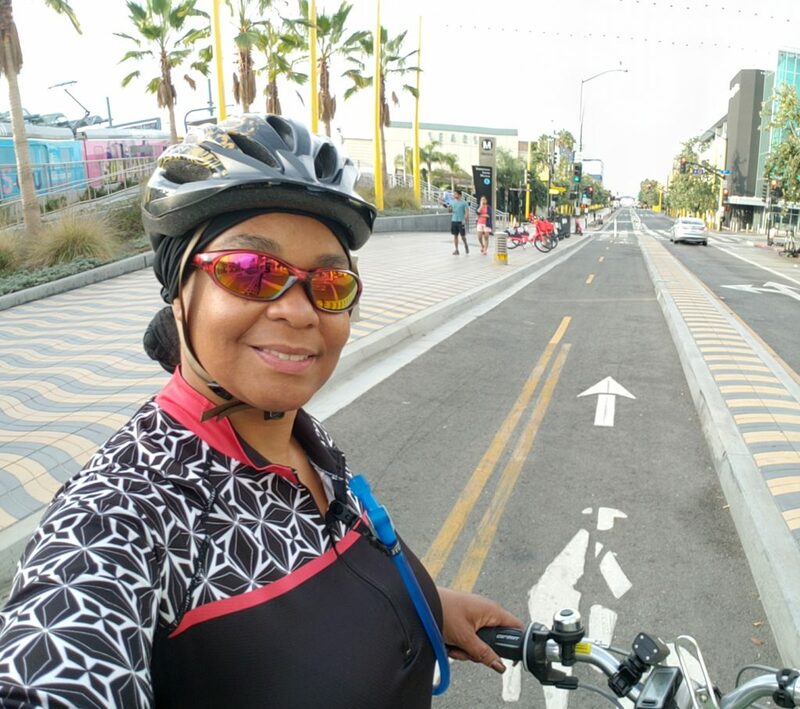 It’s a beautiful feeling to exit the train, walk down a ramp straight to the bicycle trail with a clear view of the Santa Monica Pier entrance. Every Sunday volunteers with Veterans for Peace set out hundreds of crosses on the beach in Santa Monica to honor the cost of war and to remind beach goers about the sacrifices veterans made for independence. The memorial is also referred to as Arlington West, a nod to Arlington National Cemetery in Virginia. Veterans for Peace was founded in 1985 to bring together veterans interested in working toward alternatives to war. In the 1930s the Ballona Creek flood control was channelized in concrete to reduce the inflow of salt water to what is now one of the last significant wetlands areas in the Los Angeles basin. 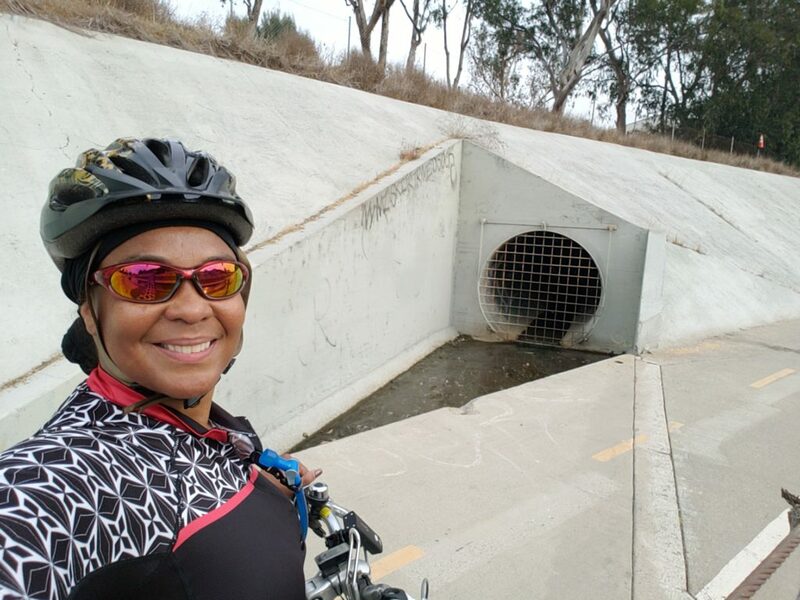 The entrances to the bike trail are locked when there is a possibility of substantial rain because the creek waters rise quickly and may submerge on portions of the trail. 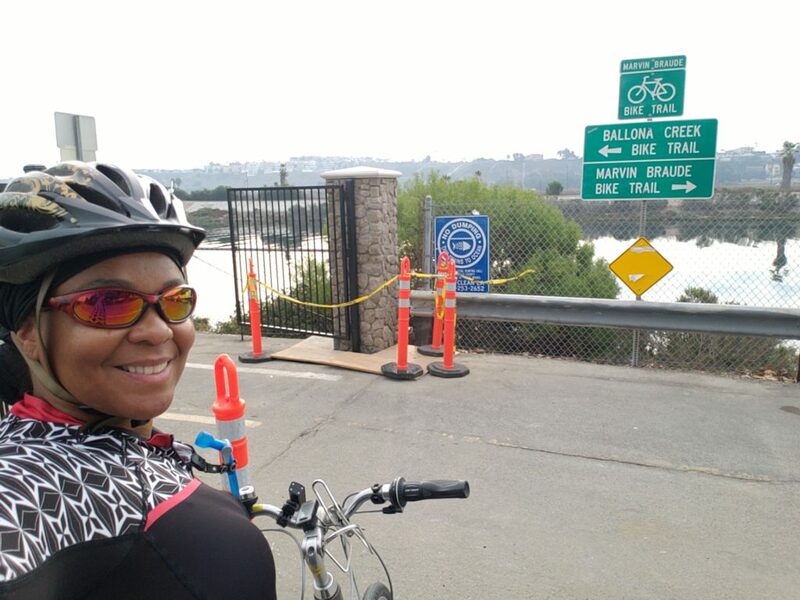 The Ballona Creek Bike Trail starts in Marina Del Rey and ends in Culver City. 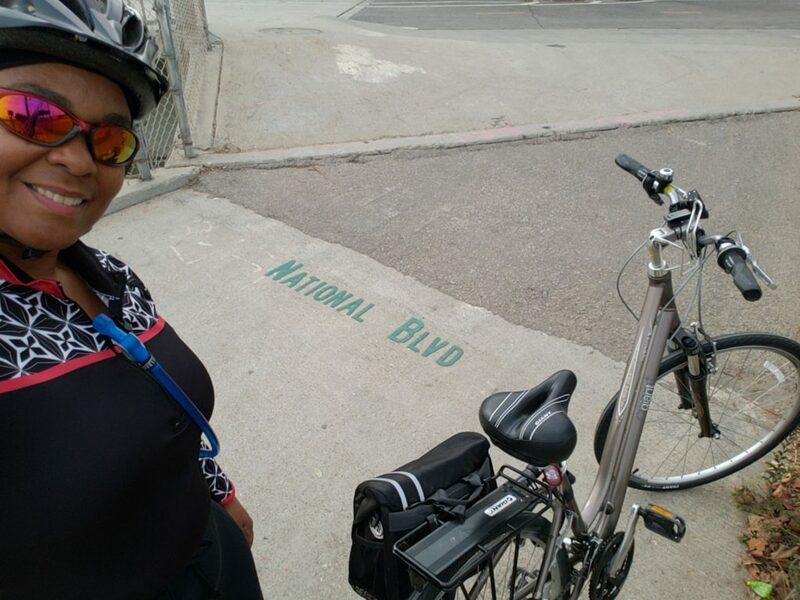 The Ballona Creek Bike Trail is open year-round to walkers, joggers and skaters. 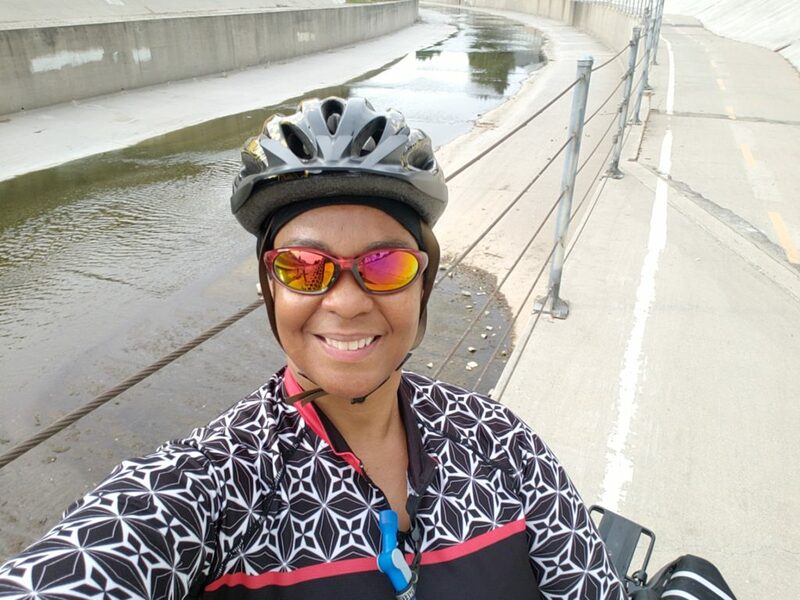 I recommend riding the trail during day light hours as there are limited lights on the trail for night riding and it’s a safe place to ride a bicycle without the presence of eScooters!